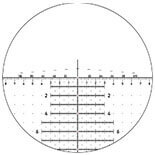 Tangent Theta 5-25x56mm model TT525P Rifle Telescope is an extreme-range precision sighting instrument for professional marksmen. Designed for heavy field use, Tangent Theta’s industry-leading development team has used their extensive experience to optimize and refine it for unfailing ruggedness, mechanical precision and unsurpassed image quality. Elevation and windage mechanisms exhibit precise tactile response and feature a truly TOOL-LESS RE-ZERO® procedure.